"Our beer lovers have been asking us to craft a pale ale, so we did! 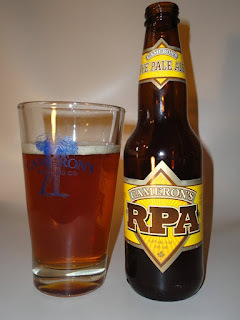 Cameron's answer to IPA is RPA or Cameron's Rye Pale Ale. Cameron’s newest release for pale ale lovers is inspired from both British and American interpretations of India Pale Ale beer styles. Who said rye is only used to make pumpernickel bread? It's also used in pale ales and the result is a spicy, dry, quenching beer, Cameron's twist on the ordinary. This glorious hazy orange-amber brew with a well-constructed white head has an up front citrus aroma followed by a complex malt body with a hint of peppery rye which releases earthy floral British hop flavor on the finish." Look for it where fine beers are sold!